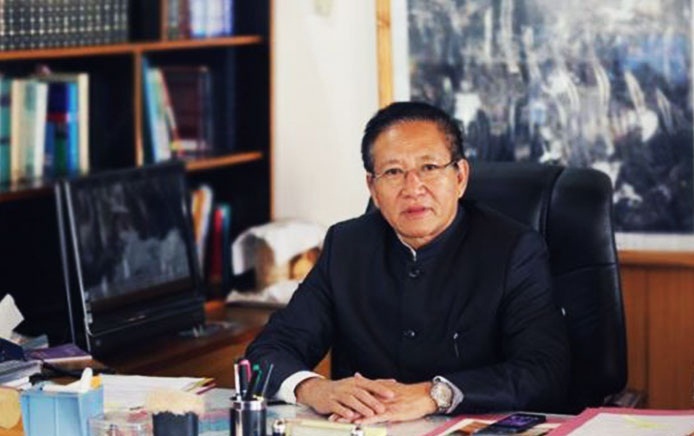 Former Chief Minister of Nagaland T R Zeliang has threatened legal action against a news portal Swarajya.com and its associate editor Jaideep Majumdar, if the latter did not issue a clarification and apologize regarding a news item before six pm on Sunday. 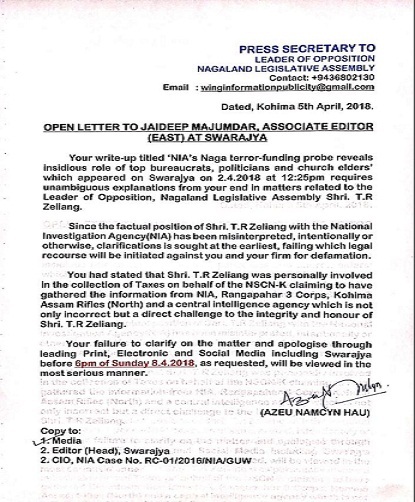 In an open letter issued through his press secretary, Azeu Namcyn Hau, Zeliang who is now the leader of Opposition has sought ‘unambiguous clarification’ from Majumdar for his news article ‘NIA’s Naga terror-funding probe reveals insidious role of top bureaucrats, politicians and church leaders’ in Swarajya.com that appeared at 12:25 pm on April 2 last. The letter also warned that since the factual position of Zeliang with National Investigation Agency (NIA) was misinterpreted, ‘intentionally or otherwise’, legal recourse would be taken against him and his news portal, if the clarification was not provided at the earliest. According to the press secretary, the author’s mention in the article that information of Zeliang being personally involved in collection of taxes on behalf of NSCN (K) was gathered from NIA, Army’s Rangapahar based 3 Corps Hqs, IGAR (N) Hqs Kohima and a Central intelligence agency was not only incorrect, but a ‘direct challenge to the integrity and honour of the former Chief Minister. 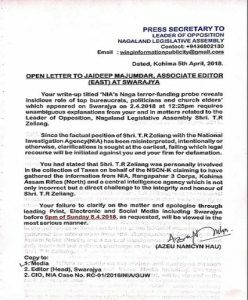 The letter further warned that failure to issue the clarification and apology through leading print, electronic and social media, including Swarajya.com, before the deadline ended would be viewed in the ‘most serious matter’.